Laura De Santis1, Richard Levy2, Tim Naish2,3, Frank Rack4, Robert DeConto5 and Carlota Escutia6 on behalf of the Scientific Committee on Antarctic Research, Antarctic Climate Evolution Project (SCAR-ACE). 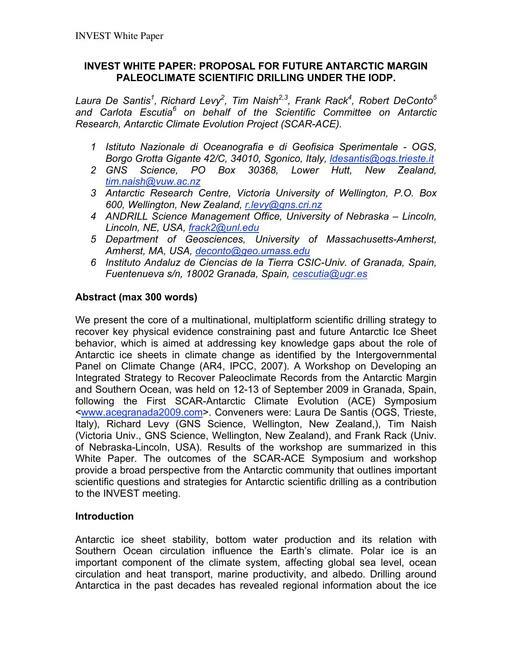 We present the core of a multinational, multiplatform scientific drilling strategy to recover key physical evidence constraining past and future Antarctic Ice Sheet behavior, which is aimed at addressing key knowledge gaps about the role of Antarctic ice sheets in climate change as identified by the Intergovernmental Panel on Climate Change (AR4, IPCC, 2007). A Workshop on Developing an Integrated Strategy to Recover Paleoclimate Records from the Antarctic Margin and Southern Ocean, was held on 12-13 of September 2009 in Granada, Spain, following the First SCAR-Antarctic Climate Evolution (ACE) Symposium . Conveners were: Laura De Santis (OGS, Trieste, Italy), Richard Levy (GNS Science, Wellington, New Zealand,), Tim Naish (Victoria Univ., GNS Science, Wellington, New Zealand), and Frank Rack (Univ. of Nebraska-Lincoln, USA). Results of the workshop are summarized in this White Paper. The outcomes of the SCAR-ACE Symposium and workshop provide a broad perspective from the Antarctic community that outlines important scientific questions and strategies for Antarctic scientific drilling as a contribution to the INVEST meeting.